Fits Model Year(s): 2014, 2015, 2016, 2017, 2018 and 2019 Dodge Durango. Features: This is exceptionally engineered 3M, Ritrama or Avery, high performance, 2 mil cast vinyl with permanent acrylic, pressure sensitive adhesive for the most demanding OEM automotive standards. This material is considered the best in the industry as it has unmatched quality and is perfect for outdoor durability. Note: There will be no returns on Avery and Ritrama materials as these are not considered normal stock and many times material is custom cut to produce your order. We keep basic Avery and Ritrama colors in stock but we'd like you to be aware of a 1 to 6 week wait for your order to be fulfilled on many of these custom colors. If there will be a wait you will receive an email at the email address provided at your time of checkout. 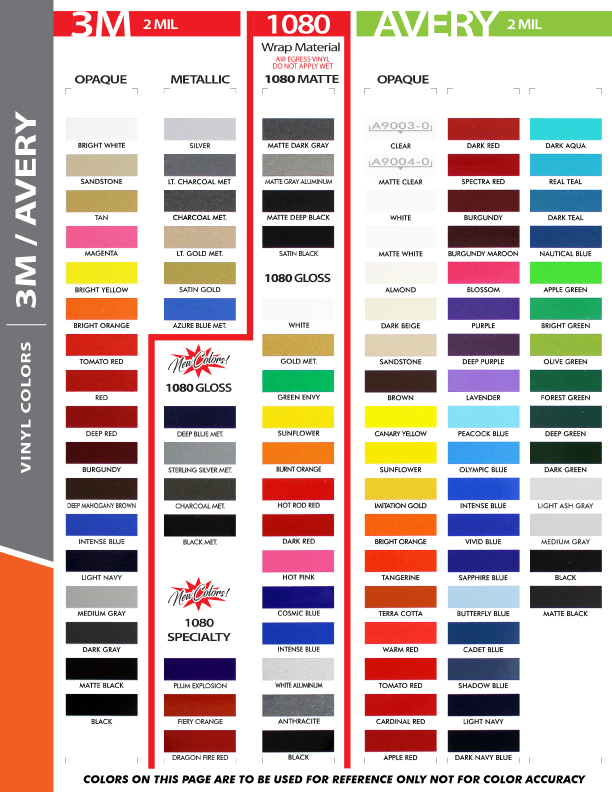 Color Availability: If you're unsure of the color or trying to match a color, we highly recommend using our color chart that is available for purchase HERE.